If you walk around the newsroom today, you will find artifacts from the reporters before us. We know the origins of some, and make up our own lore for the rest. Two old-fashioned typewriters sit by the window. There’s a plastic frame depicting the Virgin Mary, and when you plug it in she suddenly has a spinning, light-up aura. 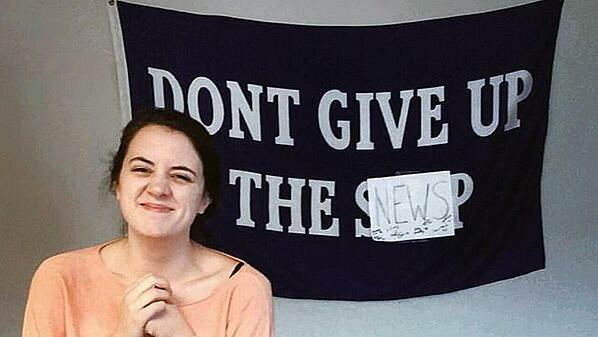 And, of course, our beloved “DONT GIVE UP THE NEWS” flag. The flag, which hangs between the pitch board of article ideas and the staff roster, actually says “DONT GIVE UP THE SHIP,” but a group of students from the early ’90s wrote “NEWS” on a piece of computer paper, signed their names and taped it over the last word. Because of the size of the paper, the “S” and “P” are still visible on either side. When I first joined the News my sophomore year, an older editor jokingly told me that underneath it said “DONT GIVE UP THE SOUP.” By the time I realized — months later — what it actually said, “DONT GIVE UP THE SOUP” had already become a poignant and funny stand-in for overcoming any obstacle, news-related or otherwise. The 2017–2018 academic year was challenging. The class of 2017 was particularly involved with the newspaper. 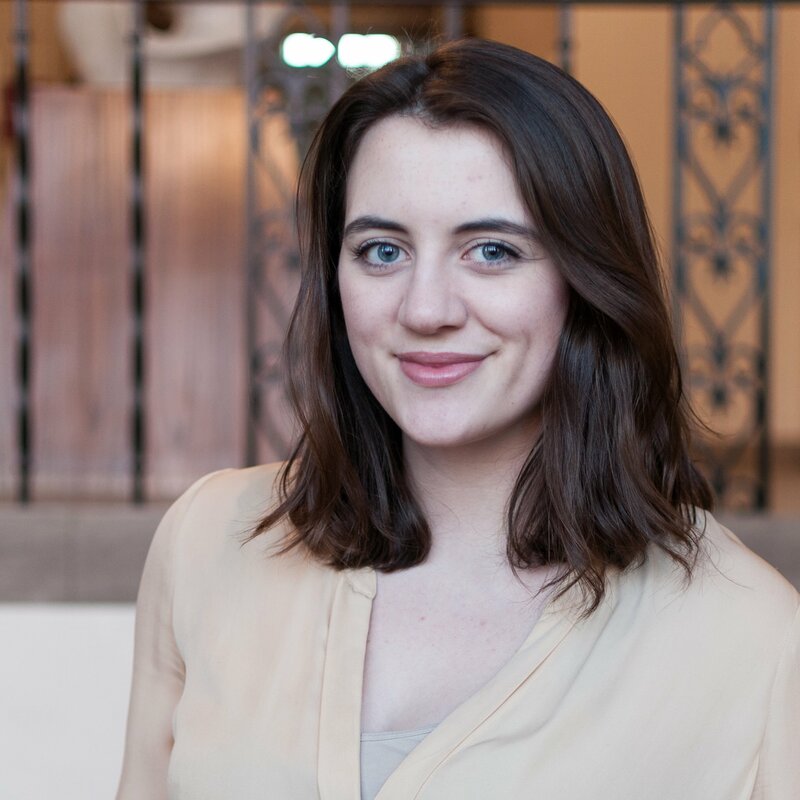 Many members of the current executive board were abroad during the 2017 elections, so we never received the traditional training from the former board. I was worried that my experience in running the one-page arts and entertainment section wasn’t adequate preparation for organizing a 12-page weekly paper as editor-in-chief. At the same time, I had big dreams. I envisioned a bigger paper and a better website. I wanted the newsroom to feel more welcoming to staff writers and artists, who often work remotely. I wanted to throw a killer holiday party, and I wanted to inspire and support young journalists. We were ambitious, anxious, excited and underprepared. If we were going to make this work, we needed a rallying cry. “Don’t Give Up the News” fit the bill. To announce my new position back in spring 2017, I shared the picture above of me and the flag. It served as my mantra as I sent out dozens and dozens of emails that summer, trying to learn the names of the new staff. It was what I told the room full of first-time editors on a particularly slow news week, or shouted in the newsroom on a Wednesday night when we were all behind deadline. Somewhere along the way, the saying caught on. 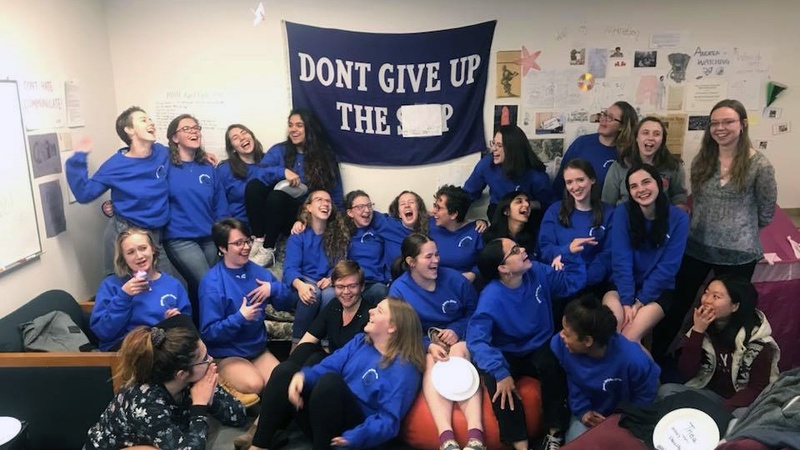 “Don’t Give Up the News” has taken on a whole new level of relevance to this year’s staff — we’ve put it on sweatshirts, Facebook posts and GoFundMe campaigns, and the phrase appeared in all but two of this year’s senior reflections. 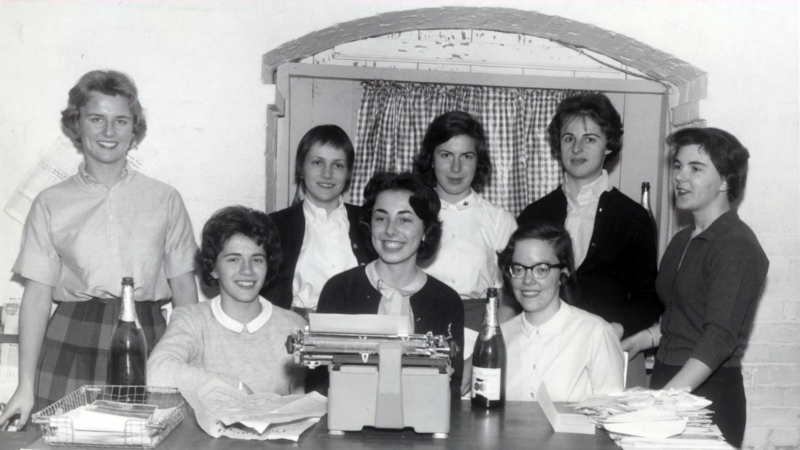 My senior year coincided with the paper’s 100-year anniversary. 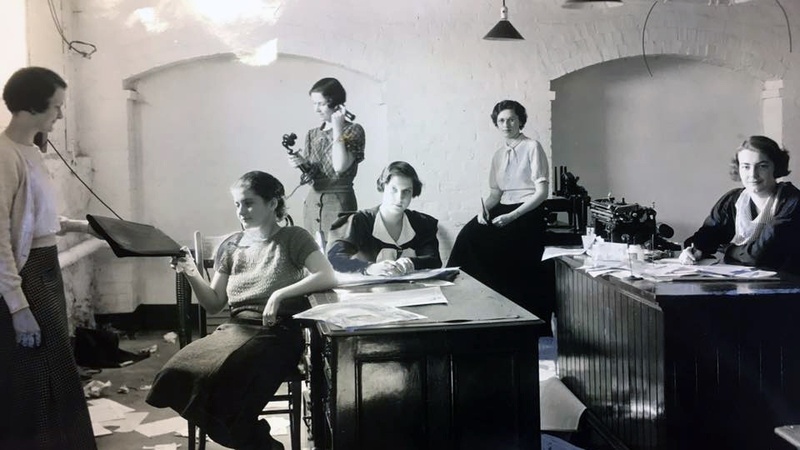 Since fall 1917, the staff of the Mount Holyoke News has been publishing the campus’s only independent student newspaper (meaning that we operate without the help of a faculty advisor). 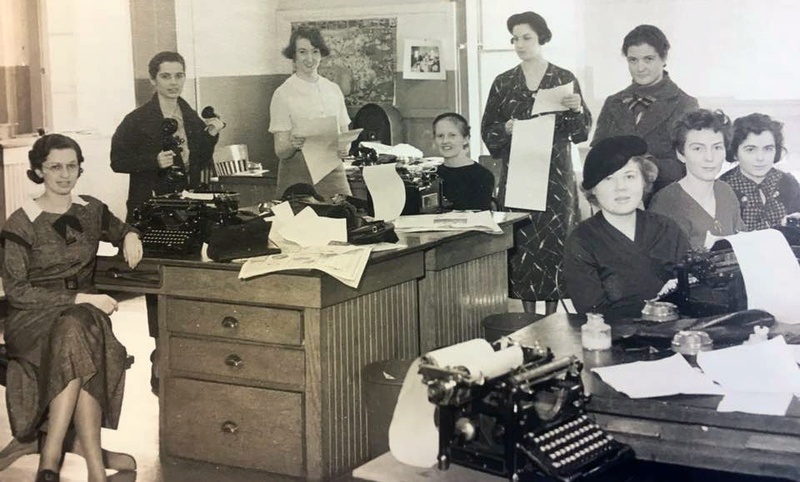 With a century of student journalism coming to a close, and a renewed national interest in investigative and watchdog reporting, “Don’t Give Up the News” speaks directly to our mission: to continue a long tradition of student journalism at Mount Holyoke, to help train future journalists and to promote the value of a free, independent press. 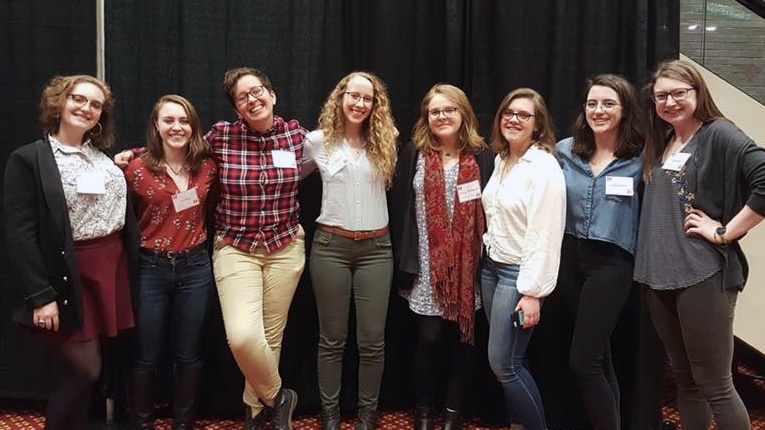 Despite our humble beginnings, this year we expanded the paper from 12 to 16 pages, improved our online presence, sent eight staff to Boston University’s Power of Narrative conference and launched the brand-new Visibility section. With so much momentum, it’s hard to leave. But the final lesson the newspaper has taught me is that there’s a difference between giving up and saying goodbye. This year’s seniors have left the org better than we found it. Many of our artifacts will be lost or thrown out, but hopefully a few will stick around and students will make up their own lore surrounding the second-hand mugs we bought for the Keurig coffeemaker, or the pink-castle play tent I regifted to the newsroom. Our greatest quotes have been taped to the wall, where the paper’s framed 2018 Excellence in Programming Award joins the 1996 Pangynaskeia Student Organization Award plaque. We leave behind a Keurig K-Cup drawer, a full-wall staff roster and about half-a-dozen holiday party decorations. Just last week, we unboxed a custom-made tapestry featuring every newspaper masthead from 1917 to today. It will be up to future staff to decide what remains and where the News goes next. 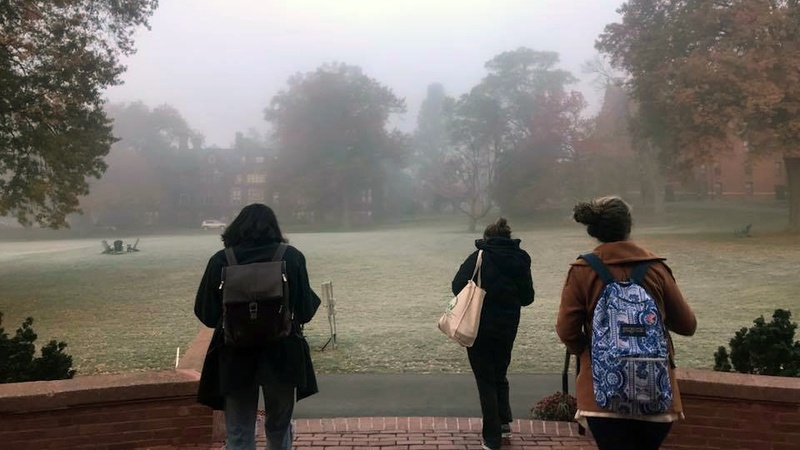 As a small school, Mount Holyoke’s student orgs seem perpetually understaffed. This can be frustrating at times, but it also opens up opportunities to feel needed. Choose the thing that you need too. 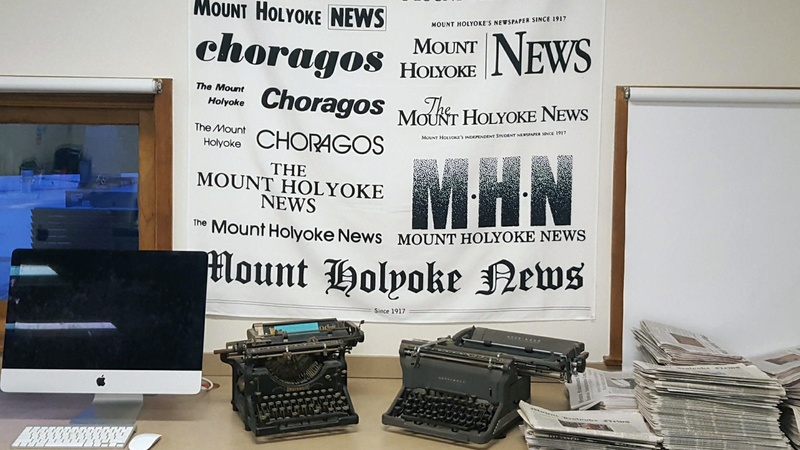 I needed the Mount Holyoke News. Even though it made my life unpredictable and there were days (or weeks) when I felt that no one appreciated the work we were doing. Even though a misspelled headline (or, God forbid, a cut-off article) could send me into a 48-hour depression. 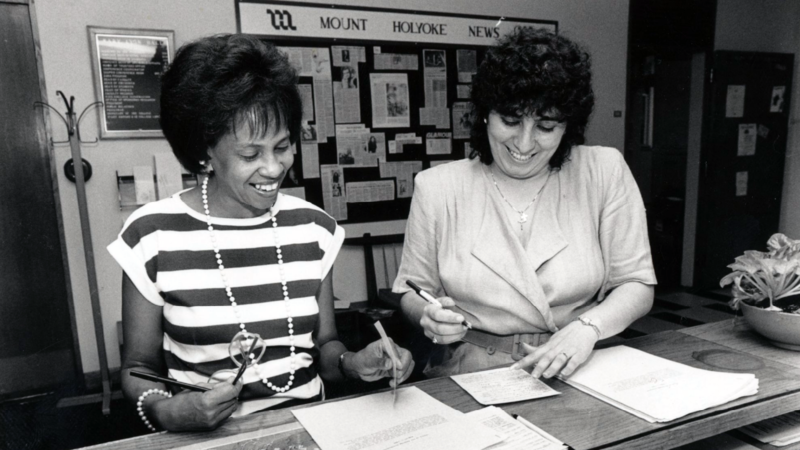 The Mount Holyoke News fostered my love of journalism and kept me up to date on campus issues and events, while simultaneously connecting me to 100 years of student history. It taught me how to stick up for myself, my work and my community. It helped me be a better friend and realize the joys of mentorship. Altogether, the News has given me a sense of belonging, pride, purpose and excitement, and wherever I go next, I know I’ll be chasing this feeling. It’s an incredible process to watch a group that you needed end up needing you in return, and then for it to not need you anymore. So don’t give up the news, or the ship or the soup. Whatever it is — whatever you need and whatever needs you — don’t give it up. Chase the thing that you need. 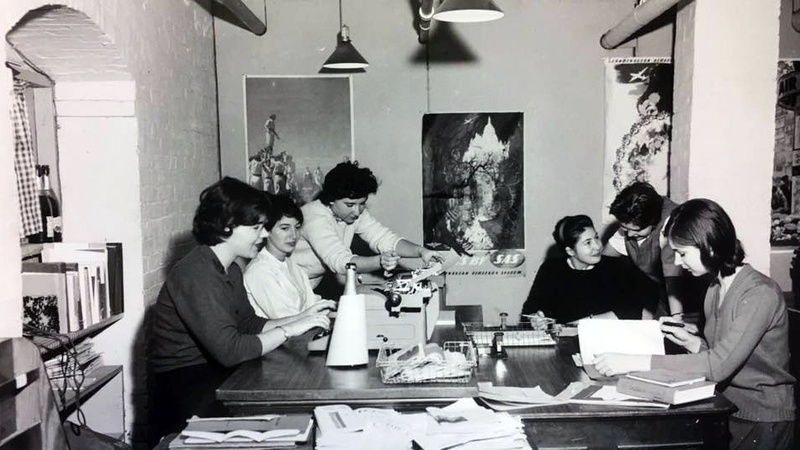 The photos below, and the black and white photo above, are courtesy of Mount Holyoke College Archives and Special Collections.